The investigation follows the deaths of 22 hippos in a month, a scenario described by authorities as strange in the history of the country. Director of the Department of Parks and Wildlife, Brighton Kumchedwa, told a local media on Friday that samples have been taken and sent outside the country to establish the cause. "We are working with the vet department officials and the African Parks who are managing the National Park to establish the cause as this is the first time for the country to witness this," said Kumchedwa. Country director for Africa Parks Patricio Ndadzera also said the development is strange as most of the times it is poaching that causes deaths of animals. Ndadzera expressed hope that by January 2019, they will have obtained results and informed the nation of the causes. 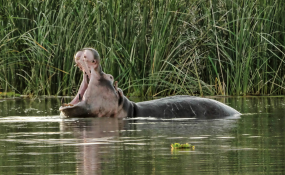 Currently, Liwonde National Park, which is in southern Malawi, has a population of 1,900 hippopotamus, according to the Department of Parks and Wildlife. Copyright © 2018 Xinhua. All rights reserved. Distributed by AllAfrica Global Media (allAfrica.com).